He stood there, transfixed, his head titled back, looking up. He was right in front of the altar, his trucks and tractors forgotten behind him. “Mommy, what happened to him? Who hurt him?” he said, finally turning to look at me. He kept asking, though, not happy with simple answers. 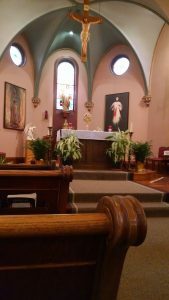 And there, in the silence of Adoration, I walked around the church with my almost four-year-old son to show him the Stations of the Cross and the story of the Crucifixion. I explained how Jesus had been a baby too, pointing to the statue of Mary holding a toddler Jesus. I told him how much Jesus loved us. And in all this talking, parsing things through so that my preschooler could grasp both the importance and the wonder of it, I found myself taking a new look at the crucifix that hangs above the altar. I couldn’t help but think of the times I’ve been eye-to-eye with it: sitting in the choir loft seating when the church is full and we are less-than-early, facing sorrow in my life and carrying a burden of tears, wondering why I bother. My son is very interested in superheroes. When he remembers that he has a Captain America costume, he doesn’t hesitate to put it on. He knows just what a superhero does and he has no doubt in his mind just how important their role is. At the beginning of Advent, as we sit on the edge of Christmas, with the halls getting decked and the anticipation building, it’s not a bad habit to get face-to-face with the reality of the Cross. The baby’s coming, and he brings change to the world. He’s the ultimate superhero, wearing a cape of swaddling clothes and with a retinue of poor shepherds. His sidekick is his mom, who does what mothers do best (which is NOT nagging!). Don’t let the reason for the season become just a slogan in your life. Grip your crucifix and meditate on the fact that the wonder of Christmas opens wide the door to the miracle of Easter. But we can’t get there without the pain and the hurt of the crucifix. As a season of penance, Advent is a great time to adopt a practice that will challenge you a bit. Maybe, instead of giving something up, you’ll want to try something a little extra. I used to hate Christmas. In fact, just the other day, “I hate Christmas” came out of my mouth unexpectedly. But what I hated – what I still hate – isn’t Christmas. It’s the bustle and pressure and demand. It’s the feeling that I can’t win or even come in second. It’s the inhuman expectation that wells within me when I think of what needs done. It’s so easy to forget that none of this is about me. Advent is a time of preparation, yes, but it’s not about how I do or what I get done. It’s a spiritual journey, and as I reframe my understanding, there’s only one place to turn: Mary. 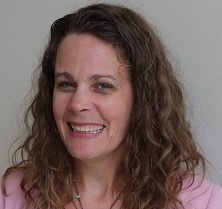 Sarah Reinhard is a Catholic wife, mother, and writer living in Ohio. She writes at SnoringScholar.com in the midst of rural farm life with little ones underfoot. A convert to Catholicism, she’s still learning what to do and when to do it, and she struggles (like so many others) with keeping sight of her faith in the midst of everyday life.